Original vintage hand painted Bollywood movie poster of the epic Hindi film Sholay (1975) for sale. 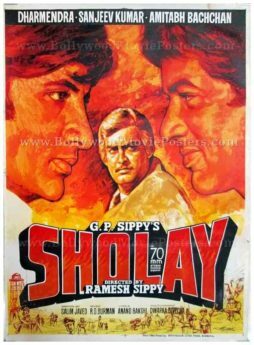 Featured here for sale is a rare surviving original first print poster of the greatest Bollywood film ever made in Indian cinema, Sholay. Printed and circulated during the first release of Sholay (somewhere in the mid 1970s), this vintage hand painted Bollywood movie poster was originally designed for publicity of the film but never ended up being used. This is an actual publicity poster from the era that the film was first released in, i.e. 1975. 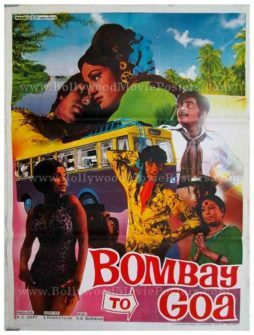 This old Bollywood movie poster was originally designed on a hand painted canvas by one of the most sought after Hindi film poster artists/painters, C. Mohan, making it highly collectible. Bollywood movie poster painter C. Mohan focuses on typography by giving maximum prominence to the title of the film, which appears in a brilliant 3D styled font engulfed in flames. C. Mohan’s original signature is clearly seen on the bottom right hand corner of this authentic old movie poster. Original vintage hand drawn movie poster of the epic Hindi film Sholay (1975) for sale. 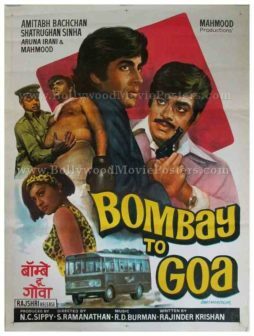 This is one of the rarest surviving original posters of the greatest film ever made in Indian cinema from the era that the film was first released in, i.e. 1975. Printed and circulated somewhere in the mid 1970s, this hand painted poster was originally designed for publicity of the film but never ended up being used. The poster features spectacular hand drawn artwork by master poster designer Parchure from Pamart Studio. 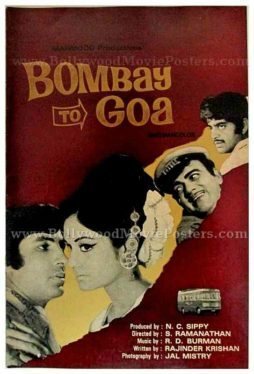 The three leading characters of the film, Amitabh Bachchan, Sanjeev Kumar and Dharmendra are seen in a brilliant hand painted rendition in the poster. True to the title and plot of the film, the entire background is seen engulfed in flames. At the bottom of the poster, Bollywood poster painter Parchure uses his sketch mastery to depict key scenes including the climax of the film. The sketches at the bottom coupled with the vibrant colors and portraiture at the top of the poster make it one of the most desirable hand drawn Bollywood posters of them all. 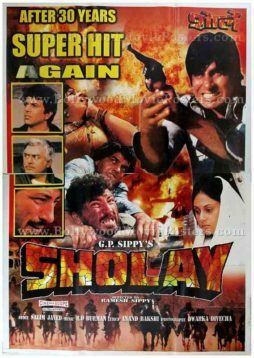 2004 re-release movie poster of the epic Hindi film Sholay (1975) for sale. Yeh Dosti (This Friendship) was one of the most popular songs from the epic Bollywood movie Sholay. 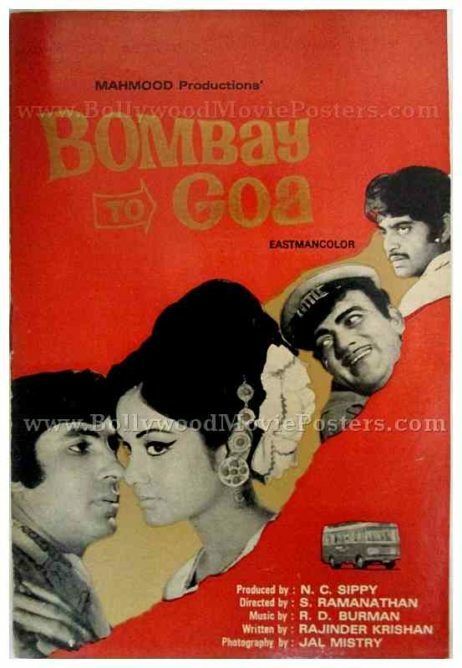 This Bollywood movie poster features a photo still from the song. 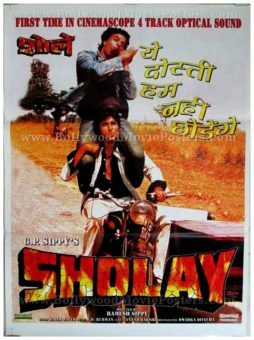 Amitabh Bachchan & Dharmendra who play the characters of Jai and Veeru respectively, are seen riding on the iconic Sholay sidecar motor bike in this glossy movie poster. Sholay is the highest grossing film of all time in Indian cinema and unanimously regarded as the greatest film ever made in Bollywood. Declared as the “Film of the Millennium” by BBC India in 1999, Sholay is an unforgettable classic that has become almost synonymous with 'masala' in Indian cinema. Its characters such as Jai, Veeru, Basanti, Thakur & Gabbar Singh have been etched into history. The film has an unbeaten record for running for over five consecutive years after being released. A 3-D version of this film was released in January 2014. Sholay enjoys a cult following in India and its dialogues are often quoted in various media.